Han Solo refused an order to kill Chewbacca and to repay this debt, Chewbacca protected Han for the rest of this life. Chewbacca is about 8′ tall and over 200 years old. 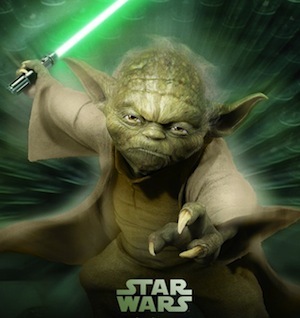 His weapon of choice is the Wookiee bowcaster which is a cross bow shaped directed energy weapon. He is named one of the greatest sidekicks in film history. Chewbacca also serves as a co-pilot on the Millennium Falcon for Han Solo. 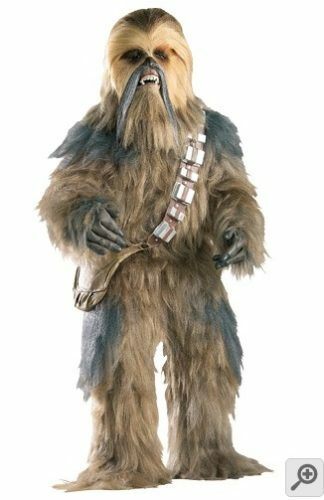 You can find Cosplay Chewbacca costume below that is authentic and realistic. 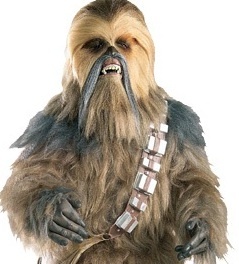 This is the most deluxe costume includes the full costume to look identical to Chewbacca. This collector’s edition suit is an officially licensed Star Wars product. 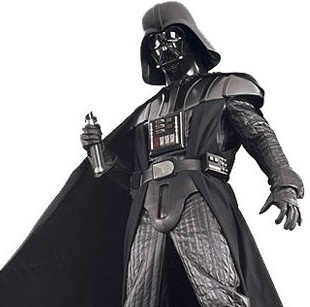 Click here to see more Star Wars costumes. Cosplay Chewbacca costume head piece is made of 100% synthetic fibers. The latex mask is covered in faux Wookiee fur and has holes for vision and ventilation. Some reviews say that the mask is big and you can actually wear a baseball cap underneath to keep the head piece on straight. Wearing a baseball cap or hard hat will help keep the eye, nose and mouth holes straight on your head. Chewbacca’s deluxe full body suit, molded latex gloves and latex foot covers are made of 100% synthetic fibers. They are covered in multi-tone faux fur with brown, grey and light tan hairs that are blended to create the Wookiee-style fur. The back of the costume snaps for fitting. 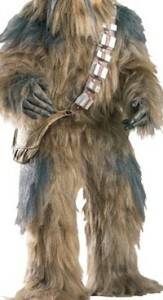 I’ve read reviews you have to keep this costume combed or risk actually looking like a real wookiee. The suit weighs about 13lbs so it’s recommended to have someone help you put it on. This professional Chewbacca costume includes his iconic latex bandolier and a pouch that you can fit around your shoulder. You can store your wallet, phone, keys and camera in the pouch. It comes in handy since you really have no where else to put your personal items. 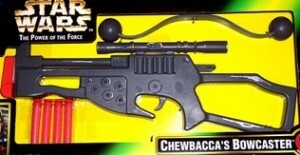 Chewbacca’s bowcaster is the Wookiee’s weapon of choice. You can blast the Rebels away, take aim for explosive inter-galactic battles. 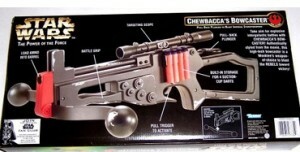 This bowcaster shoots darts, pull back the plunger and blast those Imperial Stormtroopers. Load ammo into the barrel, pull back the plunger, use the targetting scope and pull the trigger. Practice your Chewbacca sounds and noises before the Halloween party and remember to have fun!